Jarrett’s mom takes care of foster babies in New York, so Jarrett is used to sharing his home with children he doesn’t know. It’s not that big of a deal to him, until the day Kevon and Treasure show up at the door. Treasure’s fine; she’s just a baby. But Kevon? He’s TWELVE. That’s right, a whole year older than Jarrett himself. It’s not so bad being a temporary big brother to foster babies, but being a temporary little brother is something Jarrett is not at all interested in. Worse, everyone just assumes that Jarrett and Kevon will be friends with each other! Jarrett’s not sure at all. Kevon acts like he’s a good, but Jarrett suspects that he has some secrets he’s been keeping.Jarrett and Kevon navigate an uneasy peace. After all, they both have bigger concerns than just trying to make friends. Kevon worries about keeping Treasure safe in the foster system, and Jarrett is worried about trying to get his grades up so he can go on to the sixth grade. Their daily lives aren’t the only issue. 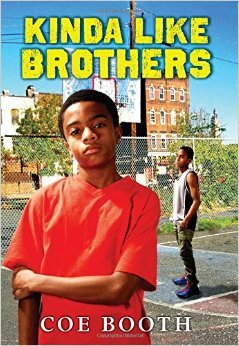 Both boys also face a racist world; when Jarrett sees a worker at the community center being stopped and frisked without cause, he is deeply angry. A worker in the center explains it this way to Kevon and Jarrett: “I’m going to keep it real with you guys, you black and Latino boys are going to get stopped a lot. And it doesn’t matter what you do, or what you didn’t do. It’s just because of who you are. And in the meantime, I need to teach you what to do when the cops stop you — not if, when.” In a 2014 interview with NPR, Coe Booth comments on that scene in the book, saying: “I think any parent or anybody who is dealing with young black boys — as is what’s happening at the community center in this book — I think every single community center has had this conversation with their boys. And it’s just so sad that we have to do this, but we do, and I hope that changes. I don’t know if what’s going on in Ferguson will change that, but I do hope it at least continues that conversation, because it’s just exhausting that this is still going on…” I heartily agree. I appreciate the nuanced, realistically complex middle school boys dealing with both the difficult situations of middle school and the ugly reality of racism in the world. This middle-school realistic fiction is a definite winner. I can’t wait to read more from Coe Booth. Go see her at her website! If you liked this book, why not try these? Posted on July 15, 2015 July 15, 2015 by ShannaPosted in Ages 11-14, Realistic FictionTagged foster children, racism.